Lots of active message areas! File Area! (Online Doors being worked on) Still under development! This is a homage to my 90s BBS I ran from home with 4 PSTN lines. BRAND NEW BOARD: mbbs1.ddns.net We have it all! Just let us know what games you want. MajorMud realm reset Jan 2019 Remember Galactic Empire? “Rule the Universe, if you can!” mbbs1.ddns.net Lots to do, come say hello! By the way, nobody is playing Galactic Empire yet. A recreated, reimagined, metallic dreams BBS from Long Island, NY in the 1990s. 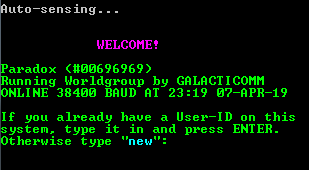 The BBS was founded in the late 90’s and originally run under CNet/Amiga primarily as a chat system with multiple nodes. Later after the main SysOp started working for Mustang Software, the software was switched over to Wildcat! 5. It is the home of wcConference and wcNNTP software. 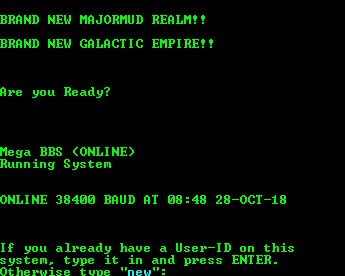 MMN is an online BBS running in Toronto since 1996, just before the internet became massive, we currently offer free email, USENET, file downloads and external IRC, FTP and Telnet to our verified users. Modem access is limited to 2400 baud since that seems to be the limit of Vonage’s fax line service. The largest repository of world heyday of shareware BBSs. Furthermore, Fidonet, Chat, Doors and more. The best argentinian BBS of all time. Just a simple Russian BBS. Warning – Russian language user interface! 🙂 Was a modem only BBS quite a long time. Nothing special there, but someone may find this interesting to look at Tornado BBS running over telnet connection. Running Mystic software. Mystic Dreams offers league games, message nets, doors, and tons of files. Running Door Party games also. This is the main Prison BBS of all that are available at RDFIG Computer Solutions. It is the flagship. Many things to do, tons of message areas including Usenet and more games you can play. It is a hobbyist board and therefore full logon access on the first logon. Running Mystic BBS under Windows and we offer many different networks and support several different computer systems.